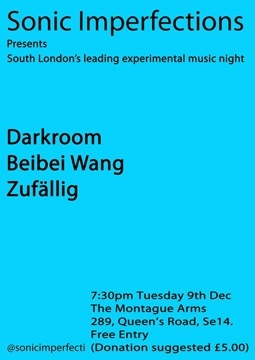 On Tuesday 9th December we’ll be playing at Sonic Imperfections, alongside Beibei Wang (water percussionist) and Zufällig (a new project from 'Death in Vegas' Steve Hellier). Our album Gravity’s Dirty Work has been reviewed by MWE3.COM. You can read the full review here, as well as an extensive interview with the band. We have a number of gigs on the horizon, all in conjunction with Tuesdays Post. October 5th and November 2nd see us playing at the regular Tuesdays Post slot (first Sunday of every month) at The Others, Stoke Newington, London. 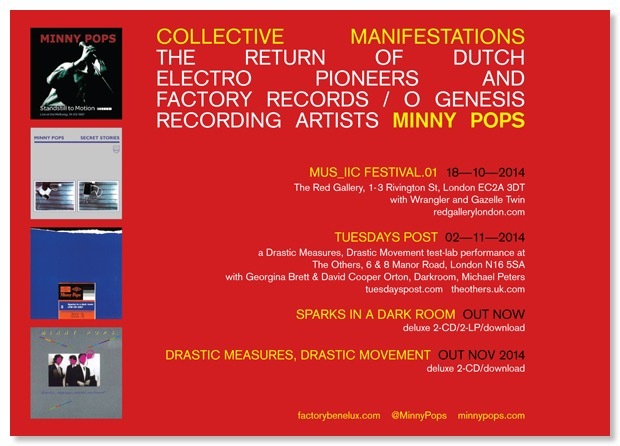 The November gig is particularly exciting, featuring as it does our old friend and looping legend Michael Peters and our new friends and Factory Records legends Minny Pops. On November 1st part of the following day’s line-up (including us) will play at Dot To Dot in Letchworth Garden City, which will be the first Tuesdays Post gig outside of London. Lots more live recordings from recent Tuesdays Post gigs have been posted on our Soundcloud page - check them out below. Our next gig is also as part of Tuesdays Post, on Tuesday 15th July. Details here. Our most recent two releases have been (favourably) reviewed by Sonic Curiosity. From our recent gig at David’s Books & Music, Letchworth UK. Three new reviews for Gravity’s Dirty Work in our reviews database. Below is the newsletter that we sent out to our mailing list a few days ago. To read it online, and to subscribe to receive it by email in future, go here. * We’re thrilled to be part of a feature on ambient music in the January 2014 issue of Prog magazine (www.progrockmag.com). Not least because we’re interviewed alongside Laraaji, whose album Day Of Radiance is an all-time favourite for both of us (and indeed, is Os’s ringtone). * Our current album Gravity’s Dirty Work also receives a very positive review (“... a totally transportive and progressive mind clearer …” ) in the same issue, and a track from the album is included on the cover CD. * Next up is a soundtrack album! We’re delighted that our music was chosen by filmmaker Chris Marsh for his sci-fi short Rhombus (rhombus2013.tumblr.com). A selection of tracks are featured, spanning the Fallout albums (early 2000’s) right up to 2013’s London Loopfest recording, via podcast tracks recorded in collaboration with Daryl Shawn (www.darylshawn.com). The film is currently doing well on the festival circuit. Thanks for all your support! Do get in touch.